Birch House dates from the 17th Century but was re-fronted in the 18th Century. It is brick faced with a diaper pattern at the first floor, and has an irregular floor plan with flanking chimneys. In recent years, Birch House has formed the centrepiece of Christmas Illuminations. However, during the Second World War, when this photo was taken, even a chink of light coming from the black-out curtains would have attracted the attention of the A.R.P. Warden. Note the ivy-covered front. 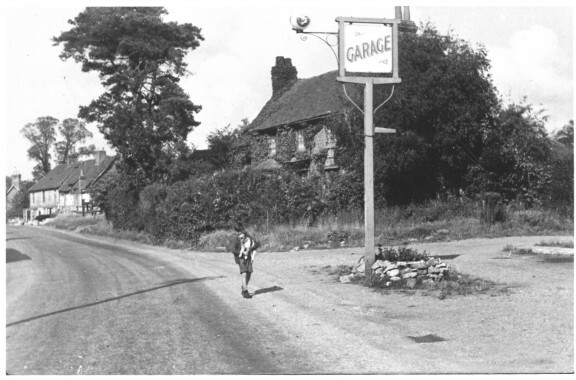 The photo was provided by the Bentley family, who ran Arborfield Garage. Three Bentley families lived adjacent to the Garage - in Magnolia Coittage and the two Whitewell Cottages.